While many people may have the impression that I “play on Facebook all day,” there is more to my job than meets the eye. First, and foremost, on a daily basis I correspond via phone, email, Facebook chat, and text message with my clients. 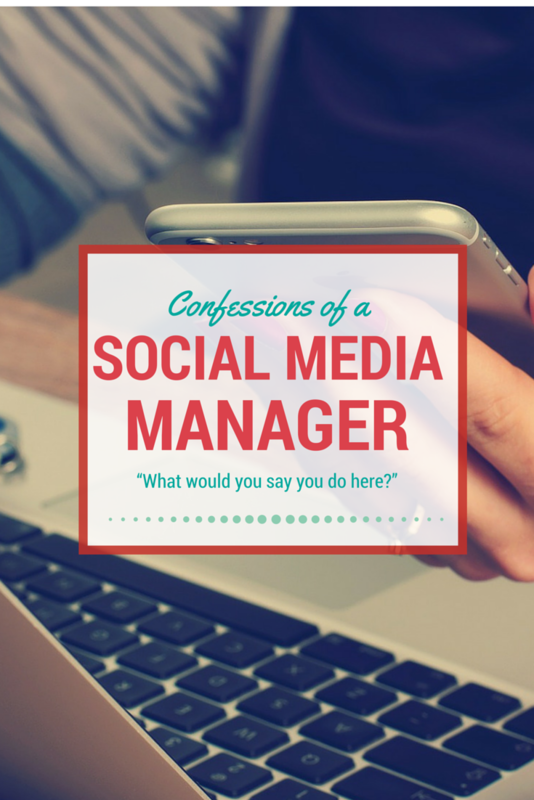 On average I have ten clients to whom I provide social media account management services. These clients hire me to manage their company’s image on social media, create and distribute e-newsletters, purchase advertising on Facebook, Twitter, and LinkedIn, create social media-ready graphics and images, provide guidance towards their online marketing strategies, as well as provide reports and analytics on their progress. My clients are my priority. Since all emails and social media notifications come to my phone, I am able to respond quickly and efficiently to any questions or problems they may be experiencing. Moreover, since I am a sole proprietor I always provide advance notice to my clients when I will be out of the office or on vacation. As my husband can attest, I talk a lot about my clients, including updates about their company, events, and sales. I love having the opportunity to work with such a diverse client-base that provides great products and services within Ontario. How do you know you have achieved your goal if you never set one? When taking on a new account management client, the first step is to develop a simple strategy, answering the questions: “what does the client want to achieve?” followed by “what are the steps to achieve that goal?” Before getting started with a client I must understand the client’s existing marketing strategy: “what marketing tactics do they employ?” and “are these tactics working?” Social media is not a standalone silo – rather it is integrated across a company’s marketing, human resources, and customer service departments. Do you know why? Because I only use the bright green logo, with Arial font, and one professional photo for everything – website, Facebook, Twitter, LinkedIn, Pinterest, Instagram, Vine, Google+, print collateral… even my pens are bright green with Arial font! While my brand strategy is simple, it is seemingly effective. I do the same thing for my clients. I ensure that their company’s brand is consistent across online mediums including social media, e-newsletters, websites, and anywhere online. When I find something that’s not consistent I will bring it to their attention, and we will take steps from there to find a solution. 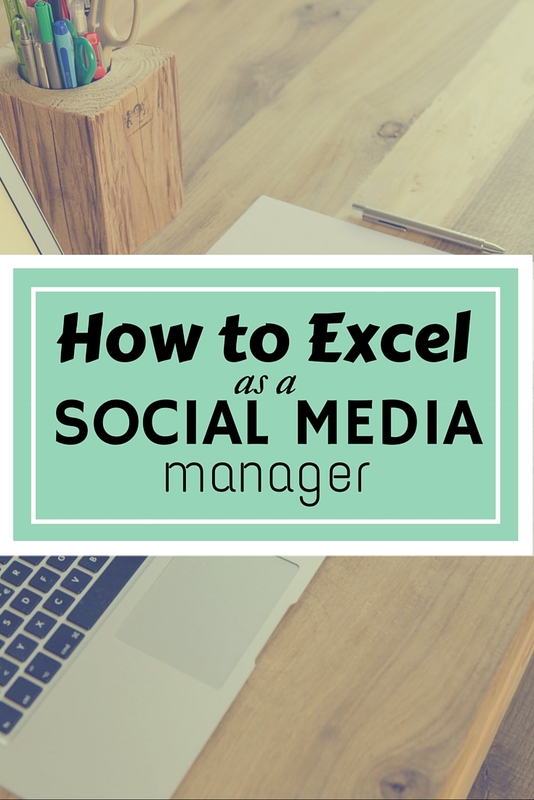 Social media management is not just about scheduling and posting updates to Facebook and Twitter. If that was the case we could just go back to using a fax machine for all of our communication and marketing needs. Social media should not be one-sided. Social media is meant to be social! Social listening can be done through social media management platforms like Hootsuite by setting up search queries related to your company. 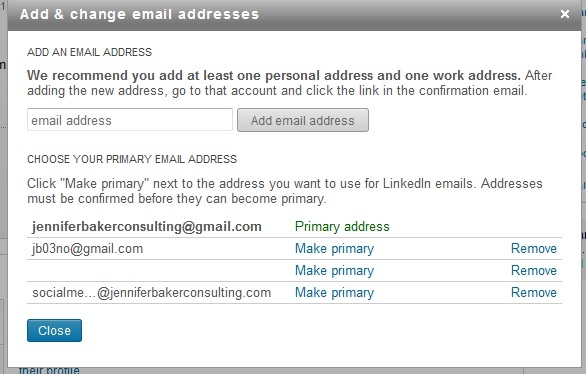 Users can set-up a search query that finds social media messages that include common misspellings of your company name (Think autocorrect!). Social media users may think they’ve correctly tagged your company in a post, and may get angry when they don’t get a response – even if they’ve incorrectly tagged you! This is why social listening is important. Social listening will take time, but it sure is fun to hear what people have to say about you! Happy: These posts characteristically come with smiley-face emojis. J Positive, happy comments are wonderful! I love responding and interacting with these social media users. Unhappy, but polite: These users had a negative experience, are upset, but polite. These users are also easy to respond to and rational. When finding a solution to the problem, they accept suggestions with grace. Unhappy, but angry: These users had a negative experience, are rude and irrational. These users do no respond well to suggestions and are typically demanding and use vulgar language. When solutions are offered, they quickly respond with threats, like “I will never shop here again” or “I will tell everyone how terrible you are!” Despite our best efforts, unfortunately sometimes there is nothing you can say to please these types of individuals. Yes. Lucky me! I get to “play” on social media all day. When I do get time to “play” on social media platforms, I am actually poking around to self-educate myself on recent updates and changes, reading FAQs, and updating my social media skill-set. The more I know the better service I can provide for my clients. Social media is an industry in which life-long learning is critical! While I do spend a lot of time on Facebook, there’s more to my job than meets the eye. There’s a significant amount of work that is completed offline so that when information is presented online, it is effective! Your business is on Facebook, Twitter, and tumblr. You’ve got plenty of fans, and followers on each of these platforms. Employees have even enrolled in social media training courses to become effective and efficient bloggers and tweeters. But is anyone monitoring what is being said about your company or brand by your customers? You’re in luck because there are great (and free!) social media monitoring platforms. Some of these online tools include including Kurrently, SocialMention, Topsy, and HowSocialble. Think about it as Googling your brand, but being able to access information held in social media platforms like Facebook, Twitter, and Google+. Let’s use SocialMention for an example about the City of Kingston, specifically the hashtag #ygk. 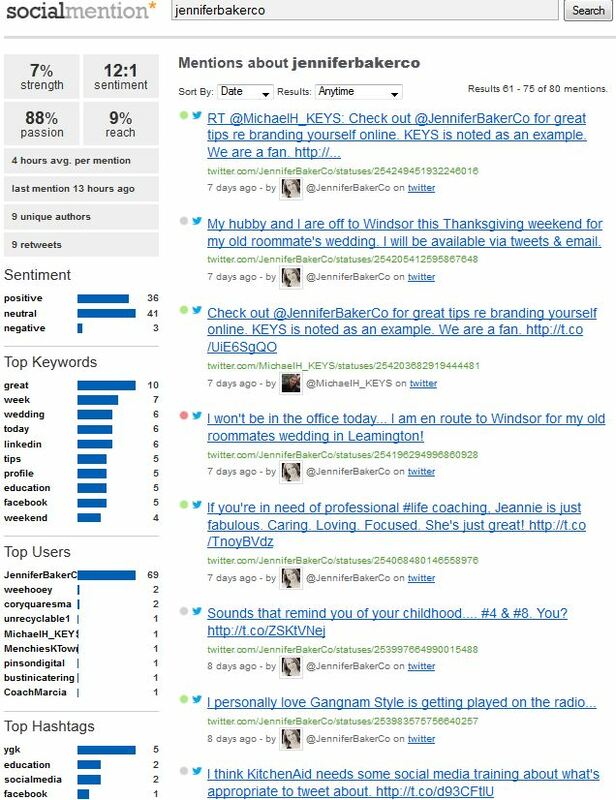 SocialMedia collects lots of information about your brand including sentiment, keywords, top users, and recent mentions with #ygk. 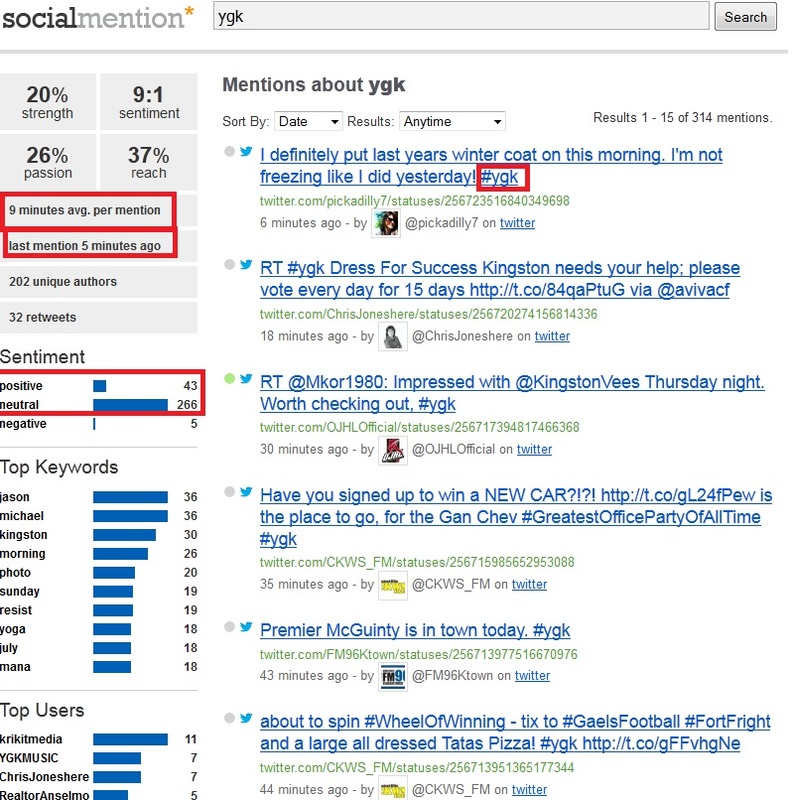 From our #ygk example we learn that the most recent mention occurred 5 minutes ago. The overall sentiment of the activity is 13% positive and 84% neutral. The third top keyword is (…no surprise here!) Kingston. SocialMention also provides a list of the most recent tweets including #ygk (these are mentions), including the date and the author. Okay… let’s try my brand. Using SocialMention, I will search JenniferBakerCo. Of my activity on social media 45% is positive and 51% is neutral. I guess I am a fairly happy person! The negative sentiment comes from telling fellow tweeters “I won’t be in the office today.” SocialMention picks up the negative aspect from that sentence. Some of the top hashtags include #ygk, #education, #socialmedia. I suppose I am on track as I train people how to use social media tools! Take a moment today and see what people are saying about your brand. Let me know how it goes!